For Part 1, look here. In Delhi, green tends to come in dustier shades, but there’s so much of it. The area adjoining Hauz Khas Village is a great example – the trees grow thick and a little wild but sadly the deer park appears bereft of deer. The village, swallowed whole by a ravenous, growing city, is now famous for its upmarket boutiques and one of the highest densities of restaurants per square metre to be found in India’s capital. We walk in, my friend intent on plying me with her favourite treats – a lemon tart at Elmas’s bakery, an Italian pizza at Diva Picolo – but I’m distracted by the promise of a kulfi from a stall outside. Dense and cold, studded with badam, kulfi turns to cream in the mouth and some of my favourite childhood memories involve eating it. I remember we would descend on the kulfi cart, a horde of scuffling, screeching children, each demanding a kulfi stick in exchange for our 10 rupee coins. The more hygienic, fancier version I’m savouring now is closer to 80 INR. It’s not just the kulfi, everything in Hauz Khas village is expensive. From the ‘vintage clothing’ which sells for ridiculous prices to the fashionable boutiques that stock garments designed by some of India’s biggest names. My advice? Go there for the food, the window shopping and for the chance to wander down pretty, winding alleyways. Meander far enough in and you’ll find a surprise, an exquisite arrangement of Mughal architecture bordering a large lake. You know now where Hauz Khas, literally ‘royal tank’, gets its name. The view, complete with the tomb of Firoze Shah, a mosque and pavilions, is truly lovely. The architecture itself dates back to the 13th century, with a plaque that claims the tank was built to supply water to the medieval city of Siri, once part of the Delhi Sultanate. I enjoy our time in Hauz Khas, but when it comes to shopping, I would much rather find my way to Dilli Haat. There’s more than one so make sure to ask for Dilli Haat, INA. People willing to brave the crowds and bargain in earnest should tackle Sarojini Nagar Market but if you’re interested in local crafts this is the place to come. Set up as a village marketplace, the stalls are rented out on rotating basis to craftsmen and women from all over India. They come and stay for 15 days, many selling items you’d be hard pressed to find in the city otherwise. They’re also very affordable, especially if you’re good at friendly negotiation. Everything from silver jewellery to tribal art, chikun-work kurtas to hand blockprinted bedsheets are on sale. I’m sorely tempted by exquisite hand-woven silk saris in cream and blue selling for a mere 4,500 INR. I know how much these cost in Colombo. Weighed down with shopping bags, what we do end up doing is plonking outside a stall with the beguiling name of Momo Mia. On their menu are momos, my favourite Tibetan dish. The dumplings, stuffed with minced meat, are steamed or fried and accompanied with a blazingly hot red chilli sauce and a light, clear broth to wash it down. Dilli Haat is a foodie’s paradise, though you eat there very much at your own risk. They have a bad track record, as evidenced by my friend whose immediate response to hearing I’d placed my order already was to tell me the cure for a running stomach is to eat a tablespoon of dried tea leaves with water. Luckily, in the end, I do not need to take her advice. Mine to you would be to choose a stall where plenty of people are already gathered – you’re less likely to risk stale food that way. 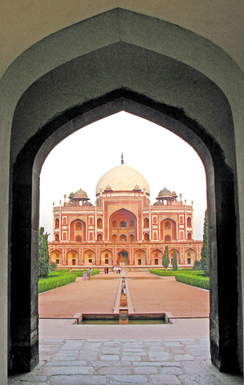 We decide to spend our last morning in Delhi at Humayun’s Tomb. Getting there early on a chilly Sunday, we discover we’re among the first to arrive. I’m glad for that quiet moment in what may be one of my favourite monuments in this incredible city.The first garden tomb in the Indian sub-continent and a UNESCO World Heritage Site, it was built in 1565, nine years after the death of Mughal emperor Humayun. The site incorporates several other beautiful structures, most notably a mosque which shares the same walled space as the gorgeous tomb of Isa Khan. Humayun’s Tomb itself, which provided an all too temporary refuge to the last Mughal Emperor Bahadur Shah Zafar in 1857, sprawls over two acres and is known as the ‘dormitory of the Mughals’: some 160 members of the royal family, including five emperors, lie buried in chambers below the monument. It took six years and thousands of craftsmen – using the same techniques employed by Mughal builders – to restore the site, which was only reopened this September.If it reminds you of the Taj Mahal it is because the tomb perfected several major architectural innovations that culminated in India’s most iconic monument. There is the same view, the long sprawl of garden, of geometric waterways mirroring the sky, the monument’s domes dominating the centre of the horizon, claiming your focus. Sitting on a bench, with chattering squirrels for company, it seems the perfect spot to say a quiet farewell to Delhi. As we leave, tourist buses pull up and visitors, cameras clicking furiously pour in. When we turn for a last look, the monument is oblivious to us all. It stands as it has through the ages, basking in the sun. Published in The Sunday Times, Sri Lanka on 29 December, 2013. Words by Smriti Daniel.